11th lunar month of 1709: first record in Kabuki chronicles; disciple of Sakakiyama Koshirô I, he performed as a katakiyaku in Ôsaka in the kaomise drama "Chigo Daimyô Kyô Miyage", which was produced by Sakakiyama Shirotarô I. 11th lunar month of 1710: Someemon became tachiyaku and performed in Ôsaka in the kaomise drama "Sasaki Uji Ôshimadai", which was produced by Sakakiyama Shirotarô I. Fall 1711: Someemon settled in Kyôto. 11th lunar month of 1711: Someemon played in Kyôto the role of Izumikawa Gonjûrô in the kaomise drama "Kikenjô", which was produced at Hoteiya Umenojô's theater by Sakakiyama Shirotarô I and celebrated the shûmei of Takioka Saburoshirô and Murayama Heijûrô II. 11th lunar month of 1717: Someemon played in Kyôto the role of Kajiemon in the kaomise drama "Genjôraku Biwa no Ôumi", which was produced by Yamatoyama Jinzaemon I in Ebisuya Kichirôbê's theater. 11th lunar month of 1718: Someemon took back his previous family name and played in Kyôto at Hayagumo Chôdayû's theater the role of Umebayashi Jûsuke in the kaomise drama "Chôseiden Kogane no Ishizue", which was produced by Sakakiyama Shirotarô I. 11th lunar month of 1720: Someemon played in Kyôto the role of Kinugasa Sanzaemon in the kaomise drama "Jûni Chôshi Megumi no Kodakara", which was produced by Sakakiyama Shirojûrô. Fall 1721: Someemon went back to Ôsaka after 10 full seasons spent in Kyôto. 11th lunar month of 1721: Someemon played at the Kado no Shibai the role of Kanzaki Mikiemon in the kaomise drama "Kogane no Shachihoko". Fall 1722: Someemon went to Kyôto. 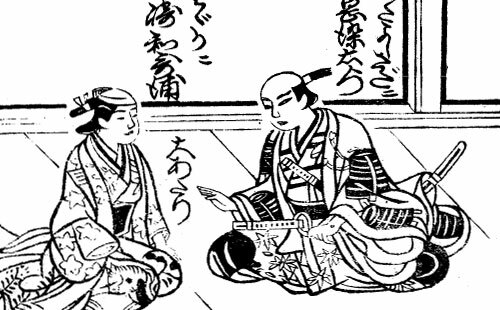 11th lunar month of 1722: Someemon played in Kyôto the role of Amateru Kandayû in the kaomise drama "Senbon Matsu Tokiwa Yakata", which was produced at Hayagumo Chôdayû's theater by Sakakiyama Shirotarô I and welcomed in Kyôto the Ôsaka star Anegawa Shinshirô I. 1731 ~ 1734: Someemon performed in tabi shibai in/around Nagoya, either as a tachiyaku or an oyajigata. 11th lunar month of 1734: Someemon became jitsuaku and played the role of Tachibana Saemon in the kaomise drama "Oyayuzuri Kogane no Katokugura", which was produced at Kameya Kumenojô's theater by Sakakiyama Shirotarô I. 1st lunar month of 1735: Someemon's rank in the Kyôto hyôbanki, jitsuaku section, was jô-jô (superior - superior). 11th lunar month of 1735: Someemon switched back to tachiyaku roles and played the role of Ishidô Tsuneemon in the kaomise drama "Shin-yakata Banzei no Ishizue", which was produced in Kyôto by Arashi Koroku I. 11th lunar month of 1736: Someemon played in Kyôto the role of Ôwada Genba in the kaomise drama "Tomi no Ichi Kogane no Aratama", which was produced by Nakamura Tomijûrô I; his stage partners were Nakamura Shingorô I, Sakurayama Shirosaburô II, Ichiyama Sukegorô I, Yamashita Kinsaku I, Yamanaka Heijûrô I, Sanogawa Mangiku, Arashi Shichigorô I and his adopted son Tatsuoka Hisagiku. 1st lunar month of 1737: Someemon's rank in the Kyôto hyôbanki, tachiyaku section, was jô-jô (superior - superior). 11th lunar month of 1737: Someemon became jitsuaku and played at Miyako Mandayû's theater the role of Akaboshi Danjô in the kaomise drama "Kuni no Tomi Sakae no Hachinoki", which celebrated the arrival in Kyôto of the Edo star Ôtani Hiroji I and the return from Edo of the local actor Kameya Jûjirô I. 1st lunar month of 1738: Someemon's rank in the Kyôto hyôbanki, jitsuaku section, was jô-jô-(shiro)hankichi (superior - superior - (white) half excellent). Someemon played in the same theater the role of Shigaraki Man'emon in the new year drama "Keisei Ômu Ishi". No record afterwards. Tatsuoka Someemon was an Ôsaka actor, who was active in Kamigata and in/around Nagoya from the end of the 1700s to the end of the 1730s. He was also a tôdori from the beginning of the 1720s. He was able to perform a wide range of male roles, as tachiyaku, jitsuaku and even oyajigata. He was said to look like the Kamigata star Osagawa Jûemon from an artistic viewpoint. He was a talented jitsugotoshi. He most likely died in 1744.